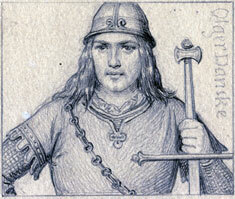 Cards from c.1850 by L. P. Holmblad showing fantasy historical Danish Kings and Queens. The original artwork for the Jack of spades (shown right) shows Holger Danske as a young man clad in armour holding a double-handed sword. The four Kings are named: Gorm den Gamle, Knud den Store (1018-1035), Erik Ejegod (1055-1103) and Valdemar Sejr (1202-1241) and their respective Queens: Thyra Danebod, Emma, Bothilde (Bodil) and Dagmar. The Jacks are either mythical or real characters from Danish history: Holger Danske, Palnatoke, Esbern Snare and Uffe hin Spage. Above: Holmblad's deck with historical courts, c.1850. The deck has never been reprinted by any of Holmblad's successors. 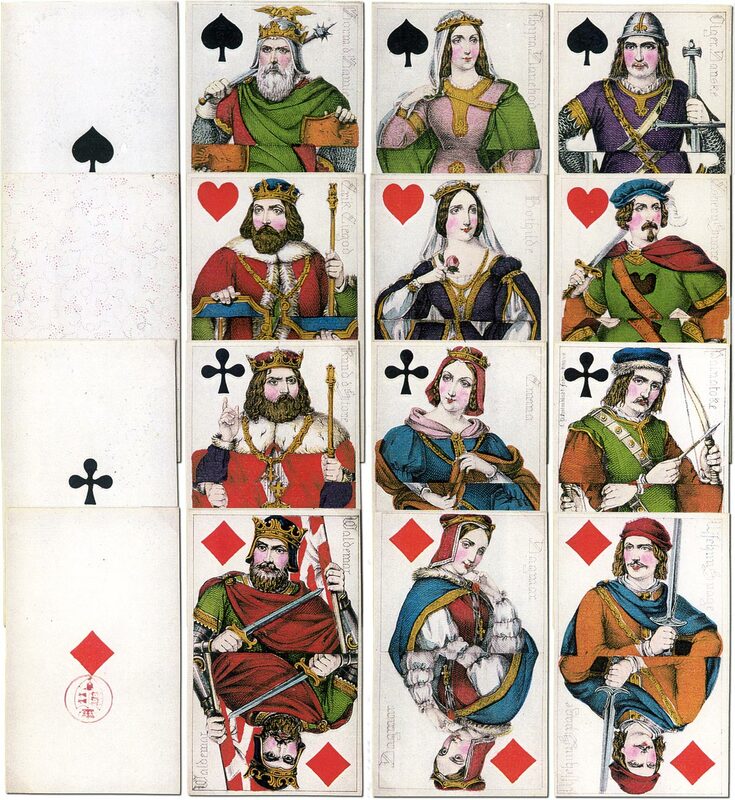 Jensen, K. Frank: Royalty on Danish Playing Cards, The Playing-Card vol.32 no.1, IPCS, July-Aug 2003.